Envision Utah - Your Utah. Your Future. Utah’s population is projected to grow from 3 million people today to 5.4 million people by 2050. That rapid growth will have a huge effect on nearly every aspect of our lives from water use to transportation to education to agriculture to air quality and more. Why a vision for the future? Our long-range visioning process is centered on two ideas: we all have a say in what the future will be and we will make good decisions if we have good information. Click here to read more. How do we create a vision? 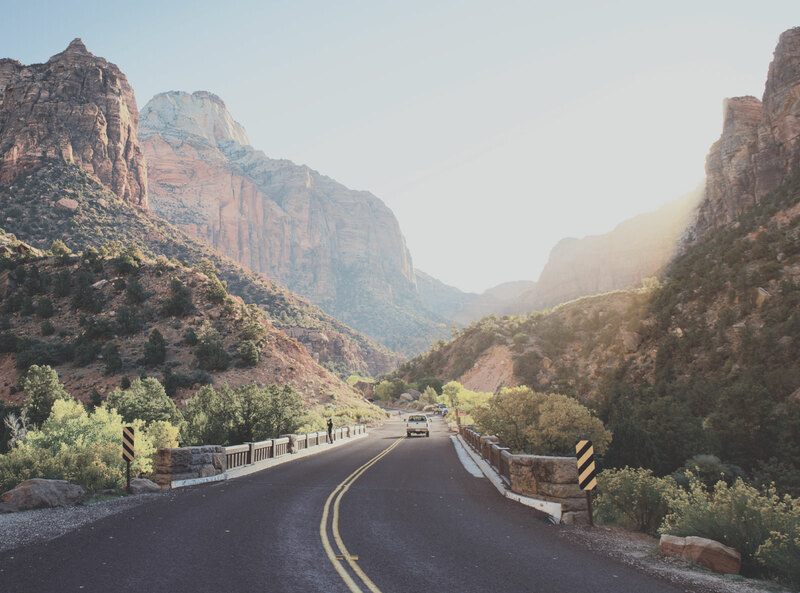 The Your Utah, Your Future survey lets you choose what you want the future to be like as you examine 11 topics critical to Utah. More than 52,000 Utahns took the survey during spring of 2015. Click here to take the survey yourself and weigh in on what you want for the future of Utah. The Build Your 2050 Utah web app lets you dive into the issues and challenges Utah faces across 11 topics. You can learn about potential choices and visualize their outcomes. The web app was built as part of an early phase in the Your Utah, Your Future process to collect preliminary data about what Utahns want for the future. Click here to play the web app. We’ve printed books for each of the 11 topics as well as an overall vision book. Each book outlines the Your Utah, Your Future process for that topic, presents the scenarios data and survey results, and presents the vision for that topic along with goals and strategies to make that vision a reality. Please contact us if you’d like to receive free copies. The results of the Your Utah, Your Future survey are available for your study and information. These results led to the creation of vision for each of the 11 topics. Click here to view the results. Our experts deliberated the best ways to address these issues for the state, developing a number of strategies and studying their resulting outcomes. These strategies and outcomes were presented to Utahns in the "Your Utah, Your Future" Survey. This survey was taken by a record-shattering 52,845 Utahns, more than any other community visioning project ever undertaken. Below we have included the results of that survey, organized by topic. They represent not only the painstaking labor of hundreds of the state's brightest policy minds, but more importantly the opinions of 52,845 Utahns on how they want to see their state grow. We'll be releasing these opinions for all eleven of the topic areas studied throughout the summer. Stay tuned for more results data in the weeks to come! Our long-range visioning process is centered on two ideas: we all have a say in what the future will be and we will make good decisions if we have good information. Values Studies—what matters to Utahns? Our effort began by asking Utahns what issues matter most when they look to the future. We conducted a statewide study of Utahns values and identified 11 issues that would be the center of the Your Utah, Your Future process. We brought together action teams to examine each of the 11 topics. In all, there were more than 400 Utah experts working to identify all the challenges, potential choices, and potential outcomes of those choices across the 11 topics. Scenarios—what happens if we do this? Or this? There is never just one path forward for any topic. Instead, there is broad range of choices, each with its own unique outcomes. We call these choice and outcome models scenarios. Scenarios are the heart of creating a vision for the future. If we have accurate scenarios about what we could do and what the results would be, we can make good choices. Public Choosing—what do YOU want to see in the future? A vision for the future is meaningless if it’s not something we create together. As soon as we have clear scenarios, we take those to the public—to people like you—to find out what Utahns want for the future. The Your Utah, Your Future effort included several phases of public involvement. The largest and final stage was the Your Utah, Your Future survey—an online tool where Utahns could examine the scenarios for each of the 11 topics and choose the scenarios they most preferred. 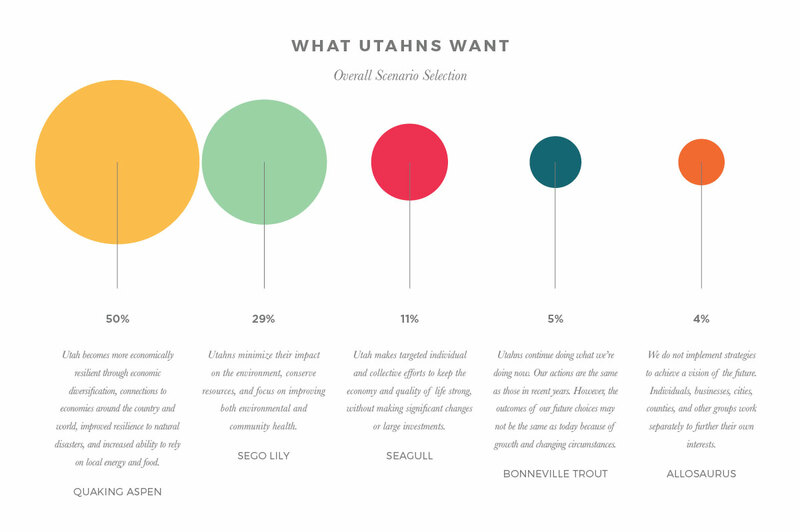 Once we see what Utahns want for each topic, we take those scenario preferences back to the action teams to figure out what it would take to make those a reality. This results in a vision statement, a set of goals, and a set of strategies that Utahns can start working on to reach the outcomes we all want. Some strategies are specific steps that Utahns can take right away. Some are long-term actions or actions that need to be taken by a legislative body.